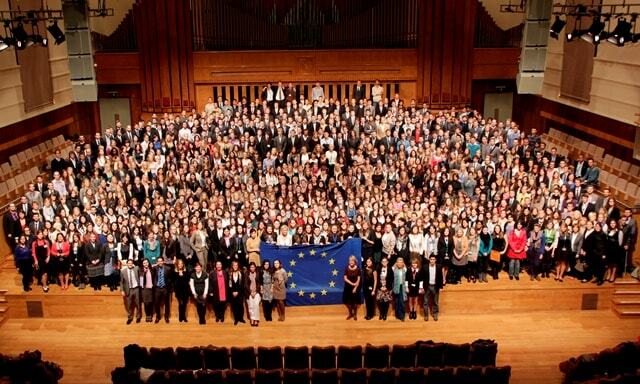 An average intern at the European Commission is 26 years old, speaks four languages and has two diplomas. Interns working in Brussels recently (July 2013) held a protest for better work conditions and pay. Some people make more than EUR 1,000 a month, but most of them work without pay for months. A report on ‘life as an intern’ from the capital of the EU. Each year, the European Commission employs 600 “Blue Book trainees,” considered to be the cream of the crop of interns, for a period of five months and a salary of a bit more than EUR 1,100 a month. The European Parliament, the European Central Bank, the Economic and Social Committee and the European Ombudsman offer internships with similar conditions, but to much fewer people. Having a university degree is a must everywhere, and experience indicates that for an application to be successful, other foreign language skills are necessary beyond English or French. At least one-third of the salary is spent on housing and another one-third on food. Those who manage their finances well and forgo luxuries such as evenings out or a visit home with the family, are left with around EUR 200-300 at the end of the month. Most people spend the money they saved on traveling after the program ends, mostly since it is rare to land a job right after the internship ends. The European Parliament groups, as well as the EP delegations of national groups also have their own internship programs. Conditions are no worse here than at the official programs of the EU institutions, but political-ideological alignment is required and applications are unlikely to be successful without a contact on the inside. Steven started working with an MEP when he was 23: “As with many other things, the work hours also depend on the given representative. Officially, work hours are from 8:30 a.m. to 5:30 p.m. on weekdays and to 2:30 p.m. on Friday. If I remember correctly, not once was I able to keep to these hours, as I assisted a workaholic MEP, so there were even 12-hour days. But no matter, someone has to compensate for some other interns who showed up at 10 with a hangover and went to siesta after lunch (and never came back),” he added. However, most of the several thousand interns in Brussels work for less money than this, or even for free, working as much as 10–12 hours a day at lobby firms, professional or political institutes and companies established around EU institutions. The interns finance their expense of living in Brussels, which comes to at least EUR 600–700 a month, either partly or fully themselves. At the end of the internship, there is usually no opportunity to move up within the organization’s ranks. According to the organizers of the Brussels protest, most interns do the same level of work as employees that work for a full salary. Moreover, many of the interns not only have the knowledge and language skills they learned at university, but have also gained work experience during their university years and are able to work independently or as part of an organization. The protest’s organizers admit that even so, interns do not count as fully-fledged employees and that the goal of the internship is primarily for juniors to learn to apply the skills learned at university. Nonetheless, they also point out that this often takes place amid humiliating circumstances. Even so, Brussels remains attractive to fresh graduates dealing with EU or international affairs since the international work experience looks good on their CV, the city itself is busting with life, and it is easier to build the contacts needed to land a good job later than anywhere else. However, unpaid internships or ones that pay less than is needed to finance living expenses lead to adverse selection. Those people whose families are unable to finance the internship fall out of the system and start off with a disadvantage on the labor market. It is also not unusual for highly trained and experienced young people to be unable to break out of life as an intern for years, as full employment is expensive and the effects of the economic crisis are felt in Brussels as well.